Sydney's $63m Bennelong Bridge - Australia's largest piece of privately funded infrastructure - has launched to the public. Unveiled on Sunday, Bennelong Bridge now cuts the distance between Wentworth Point and Rhodes from eight kilometres to 330 metres and has been built for pedestrians, cyclists and two new bus routes. The project was delivered under a voluntary planning agreement by the delivery group including four Wentworth Point landowners and headed by Billbergia Group, together with Sekisui House, Homebush Bay Holdings and Homebush Bay Properties. The Bridge is 330metres in length, 13 metres wides and includes 2 bus-traffic lanes and a shared pedestrian cycle path, and is the only structure crossing Sydney Harbour prohibiting vehicles including private cars. The Bridge will service thousands of pedestrians and cyclists each day by linking 45-50km of walking and cycle tracks in the region. 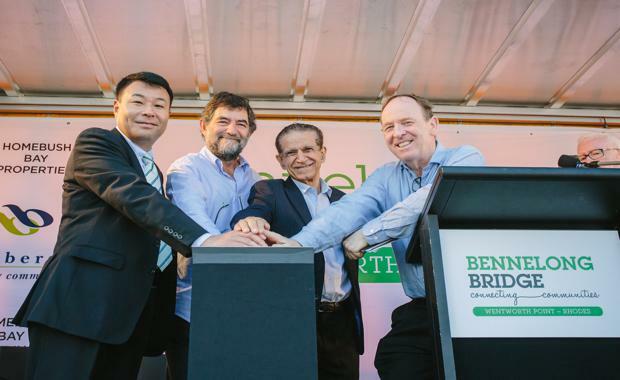 Wentworth Point Landowners representative Rick Graf said the bridge was an essential component in the delivery of one Australia’s biggest urban renewal developments, and spurring significant and positive urban change to the geographic heart of metropolitan Sydney. “As one of Sydney’s fastest growing regions, with Wentworth Point and Rhodes’ population expected to reach 45,000 within the next 10 years, the Landowners felt it was imperative that the required infrastructure was built ahead of the community demand,” said Mr Graf. Bennelong Bridge critically connects two of Sydney’s fastest growing suburbs - Wentworth Point and Rhodes - and creates a direct link between Rhodes Railway Station and the recently upgraded Sydney Olympic Park Ferry Wharf. The structure integrates Wentworth Point into the existing public transport network and provides a direct connection from Rhodes to Sydney Olympic Park. Most critically, the bridge will integrate Wentworth Point and Rhodes back into Sydney’s public transport network with Rhodes gaining access to the Wentworth Point ferry wharf; Wentworth Point will now have direct access to Rhodes railway station and new bus routes commencing 6am on Monday 23 May 2016. The Bridge is designed to accommodate the proposed $1bn Parramatta light rail project. The Bridge took 10 years planning and two years of construction to complete and is the first privately funded bridge and first new bridge to be built in Sydney Harbour since 1995.